This is one of the best Grimm brothers fairy tales for kids to read. Long ago, there was a king who had three sons. The first and second son were clever and intelligent. The youngest son did not like to speak normally. But he was honest and tolerant and was called “little fool” by the people. As the king grew older, he thought that he should choose a capable son to inherit the throne. In order to choose accurately and fairly, he called his three sons, took three feathers and said to them, “I’ll blow the three feathers up to Heaven. Follow where the feathers fly and look for the finest carpet. The one whose carpet is the best will be the future king!” Also, read King Thrushbeard. Image Source–> just4tot.wordpress.com. One feather went to the east, one to the west, the last one fell upright nearby. The oldest brothers went to the east, the next to the west and little fool stayed in the place where the feather fell upright. He sat down sadly. Suddenly, he discovered that there was a little door through a cellar beside the feather. He opened the door, went along the stairs and saw a big frog with a lot of little frogs around it. The big frog asked, “What do you want?” Little fool replied, “I want a carpet that is prettiest and most luxurious in the world.” The big frog jumped to bring the carpet. To his surprise, he discovered this was a carpet that gave off the golden light and gorgeous color. Little fool’s elder brothers thought that Little fool could not seek anything. They took the thick clothing of a shepherdess to show the king. Then, Little fool also returned and took out the pretty carpet. The king said, “According to the agreement, my youngest son has the right to inherit the throne!” The words of the king aroused the strong opposition of the two older sons and they asked the king to let them do it again. 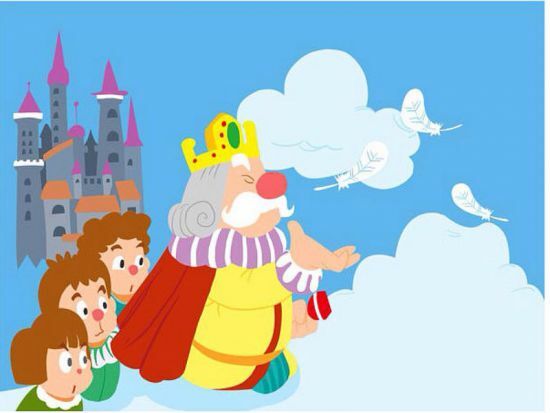 The king once more took three feathers and blew them into the air. He said, “Go follow the feathers. The one who can bring the most valuable ring is going to inherit the throne.” Two sons ran off and Little fool’s feather went again to the cellar’s entrance. He found the big frog again and he gave him the finest diamond ring in the world. Also, read Old Sultan Story. After saying this, he blew the three feathers into the air again. The three feathers flew as before. Little fool asked the frog for the most beautiful woman in the world. The frog said, “You may get her.” After the frog knocked on the ground, six mice immediately appeared with a hollow radish. Little fool saw this and asked, “What should I do?” The big frog said, “You may take a little frog and place it into the radish.” He quickly grabbed a little frog to put in the hollow radish. The little frog suddenly became a beautiful woman. The six mice became six fine horses and the radish became a luxurious carriage. Little fool drove the carriage to return to the palace. The two elder brothers each brought a farm woman. The king announced, “My youngest son shall be the future king.” The two elder brothers again quarreled which almost made the king deaf. Then they again proposed a new condition. The women who were brought there should jump over a hoop, hung in the great hall. The man who brought the winner will have the right to inherit the throne. At the beginning of the competition, the two farm women ran with great effort and they jumped over the hoop. The beauty brought by the little son whose body was light jumped over like a swallow. The two brothers finally accepted their defeat and so the little fool got the throne and became the king. You may also like to read, The Queen Bee.